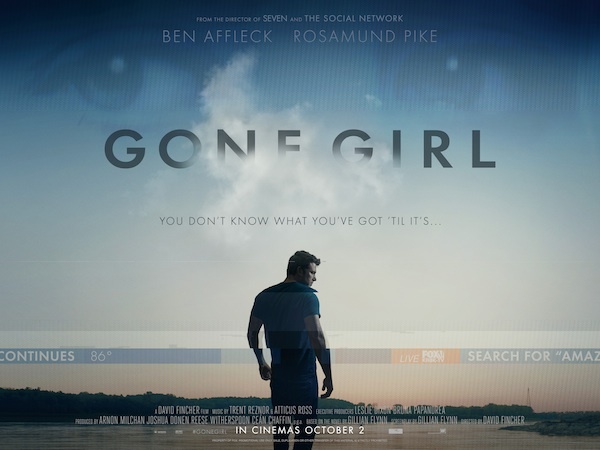 Gone Girl sees Nick Dunne’s (Ben Affleck) wife Amy (Rosamund Pike) going missing. Suspicions grow that Nick might somehow be involved as we realise their marriage was in trouble. The present day narrative is interspersed with extracts from Amy’s diary as we see how Nick and Amy’s relationship started off so brightly before family circumstances moved them from New York to Nick’s hometown in Missouri. Thematically, the film deals with the ups and downs of marriage, and the evolving relationship between a husband and wife. Is getting to know one another more and more necessarily a good thing as the years go by? What if the person you are deep down isn’t a person you want your other half to see? There’s also a critique of the media and their obsession with innocent blonde women, the ease with which they throw around accusations of guilt and their attraction the the narrative that is the most appealing, rather than the most true. Finally, while Fincher’s greatest talent is simply his ability to stand out of the way and let his source material take the weight, Affleck and Pike and well chosen as the leads of this film. Affleck’s always had this sense of trying too hard to be charming which suits the character of Nick perfectly. Amy Dunne will also be remembered as one of the great movie characters of this decade, and Pike manages to play all the sides of her character beautifully. Gone Girl then is a film which manages to largely match but never surpass the greatness of its source material. Like the book, it’s a dangerous, dark and depraved story that demands your attention. This entry was posted in adaptation, David Fincher, Gillian Flynn, Gone Girl, movie, watching and tagged Film. Bookmark the permalink.